KANSAS CITY, Kan. — Father Dan Morris has to put it on his business cards. But his new title “Vocation Director” leaves out an important nuance. Neither he, nor anyone else, can rightfully claim that title. “We are, in a sense, facilitators of the One who is [vocations director] — the Holy Spirit,” said Father Morris, who succeeded Father Scott Wallisch in July. Father Morris, who was ordained in 2015, formerly served as associate pastor of Sacred Heart Parish in Shawnee and chaplain at St. James Academy in Lenexa. Although he didn’t seek out his current role, he feels it’s a good fit. As part of his seminary pastoral internship, his “large” project was to design and teach a vocations curriculum to a seventh-grade class. “It’s kind of cool, as one of those [former] seventh-graders will enter his first year as a seminarian at Kenrick- Glennon in St. Louis this fall,” said Father Morris. While at Sacred Heart, he helped organize a three-bus vocations pilgrimage in October 2017. Almost a third of which were high school youth. “[The trip] was to expose families and young people to the reality that is seminary life and the lives of religious Sisters,” said Father Morris. Father Morris, like his predecessors, will live at the St. Lawrence Catholic Campus Center at the University of Kansas in Lawrence, and have an office at the chancery in Kansas City, Kansas. It’s a great setup, he believes. Moreover, it is from college campuses that vocations often surface. “Many young people are discerning at this time in their lives,” he noted. 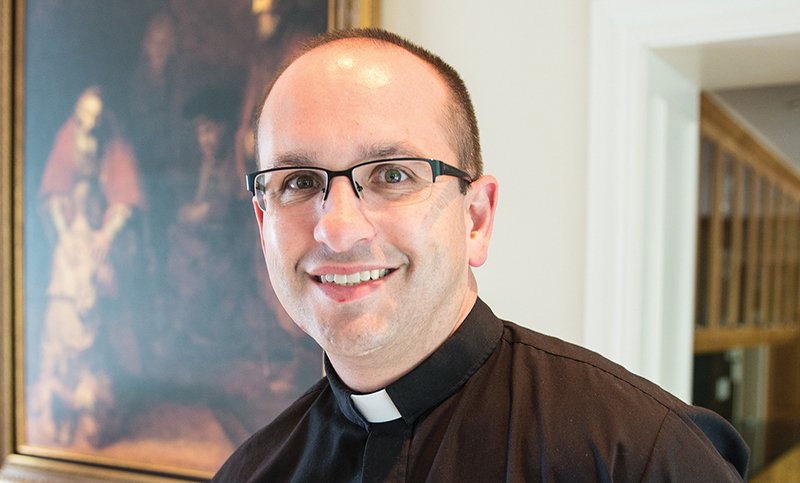 Another plus is that the chaplain- director of the St. Lawrence Center, Father Mitchel Zimmerman, is a former vocation director. The University of Kansas has been a good seedbed for vocations. Indeed, Father Morris is a 1998 graduate of KU. “My whole ordination class — all four of us — were from KU,” he said. Father Morris will celebrate Masses at the center, make himself available for spiritual direction and work with the Samuel Group for Young Discerners. So far, the transition has been a smooth one. Father Morris has worked with Father Wallisch to establish relationships with discerners and others. He has also formulated a vision for the vocations office. “My big vision is to continue building on what my predecessors have already successfully started: to keep building a culture of vocations in our archdiocese,” he said. “I want to give all people — but especially young people — permission to say ‘yes’ to their vocation,” he added. Father Morris believes that everyone knows, deep down in their hearts, what God is calling them to. Often, however, because of the culture, peer pressure or lack of support from family and friends, people don’t always feel like they have permission or the courage to say “yes” to that vocation. “Also, many people don’t find themselves free enough, on the level of virtue, to say ‘yes’ to any vocation,” he said. “I don’t just mean the priesthood and consecrated religious life. “I mean even for young couples in marriage preparation, to really have the permission to say ‘yes’ to sacramental marriage and to follow their desire to actually live out that authentic kind of love that Christ invites us to. The good news? We already have all the vocations we need. The challenge? A lot of us just aren’t aware of it yet. What is required, he said, is a team effort. Discernment doesn’t take place in the abstract, concluded Father Morris. If you’re a young person and not seriously open to all vocations, you’re going to have a hard time finding, let alone being able to say ‘yes,’ to the one God is calling you. Young people must seek — and they must pray. “If a person is in conversation with the One who is calling on a regular basis, that person cannot help but come to know, trust and ultimately desire to say ‘yes’ to the call. True, but it has also been statistically proven that the percentage of vocations from families that regularly assist at the Traditional Latin Mass is far greater than the norm. Have you considered why that is? 1. The number of vocations is so great that a specific resource is needed to help them beyond what their parish priest, family or others can handle. 2. The number of vocations is so low that a specific resource is needed to help convince men and women why they should become priests or religious since they are apparently not getting that encouragement from their parish, families or others. Which is the reason for this position in the archdiocese?